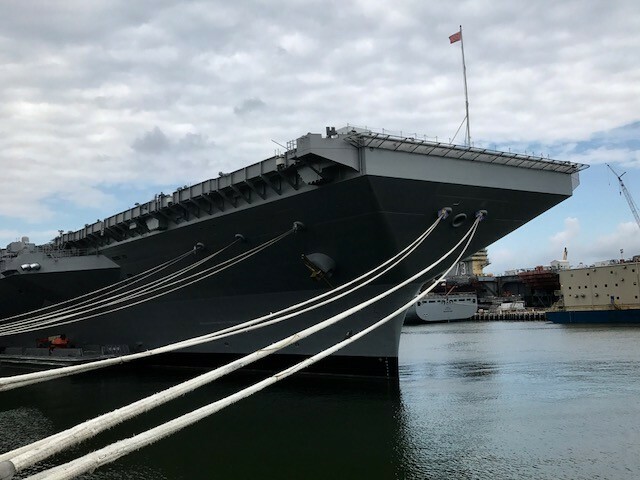 NAVAL STATION NORFOLK, VA — Smelling of fresh paint instead of jet fuel, the U.S. Navy’s newest, most advanced aircraft carrier will join the fleet this weekend, bringing the nation’s carrier fleet back up to 11 and marking the beginning of Trump’s military rebuild. The USS Gerald Ford will be commissioned this Saturday in a ceremony that will draw VIPs including Defense Secretary James Mattis, 38th President Gerald Ford’s daughter Susan Bales Ford, and perhaps even President Trump himself. 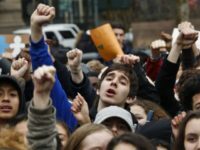 Trump has pledged to bring the Navy’s fleet up to 350 ships and the carrier fleet up to 12. The Ford’s commissioning marks a significant step towards that goal. It also ends a five-year stretch of the U.S. Navy only having 10 carriers, despite a law requiring 11 that has been waived by Congress every year since 2012. The Ford will be the first new class of carrier in more than 40 years and is designed to be more lethal, more technologically advanced, and more efficient, with a better quality of living for sailors. “This ship will make an extraordinary addition to the fleet, like no other, like no other. Anywhere in the world, there’s nothing like this. 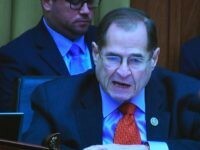 It represents the future of naval aviation,” he said. Ahead of the ceremony, a group of journalists, including Breitbart News, got a sneak peek of the brand new ship. One of the most significant changes from the previous Nimitz-class ships is that the flight deck has been designed to increase the rate of strike sorties by up to 33 percent, incorporating a NASCAR “pitstop” concept that allows for aircraft to be rearmed, refueled, and turned around faster for their next mission. “The more bombs I get over the target area, the more lethal I am,” the Ford’s commander, Navy Capt. Richard “Reddog” McCormack said on Monday. 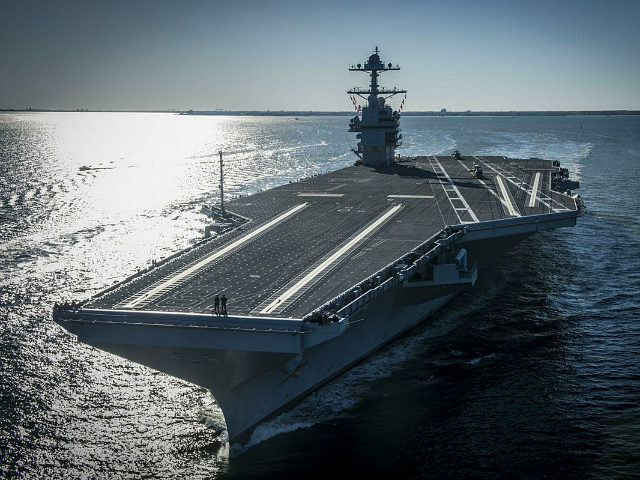 The Ford’s systems have been updated from the Nimitz-class carriers to be more autonomous and technologically advanced. For example, the helm has a touchscreen control system — the only one of its kind, according to Quartermaster First Class Jose Triana, the Ford’s leading petty officer for navigation. “There’s no more manual throttles; it’s all push-button,” he said. 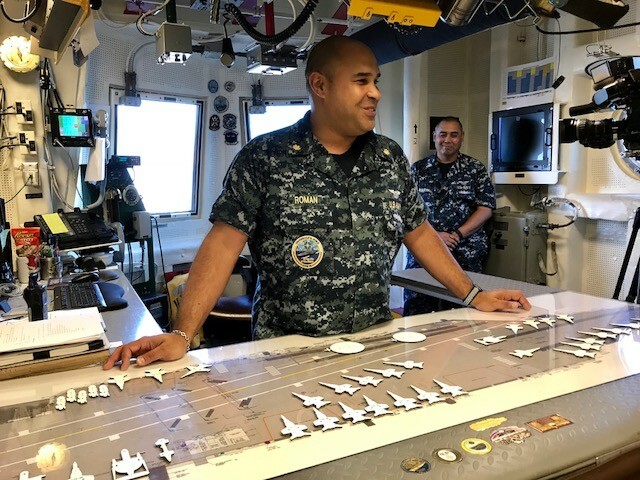 There’s also now a digital tracking system for aircraft on the ship that has replaced the “ouija board” — a board replicating the flight and hangar decks, with little rubber models of each aircraft. Navy Lt Cmdr. Jaime Roman, the Ford’s aircraft handler, said the new digital tracking system provides more information and gives a better situational awareness of what’s going on in the ship. There’s still a “ouija board” in the flight deck control room, however, but mostly for tradition. “Flight deck control just wouldn’t be flight deck control if the ouija board’s not here,” Roman laughed. One of the most significant changes is that the aircraft catapults are electromagnetic powered, versus steam-powered. The system is referred to as the “EMALS,” or electromagnetic launch system. The system is designed to be more space and energy efficient, be less costly over its life cycle, and require less manpower to operate. It is designed to be capable of launching all future aircraft in the Navy’s inventory through 2050. The Ford is also able to generate 13,800 volts of electricity versus the previous carriers’ 4,160 volts. And instead of having 100 hot water heaters, there are only 16 hot water heatings, reducing the cost of maintenance. These changes allow for about 600 fewer sailors required to man the carrier. “The initial outlay to get the technology was more, but the technology will support a smaller crew size, and eventually the overall cost will converge,” said Navy Cmdr. Allan Feenstra, the ship’s chief engineer. 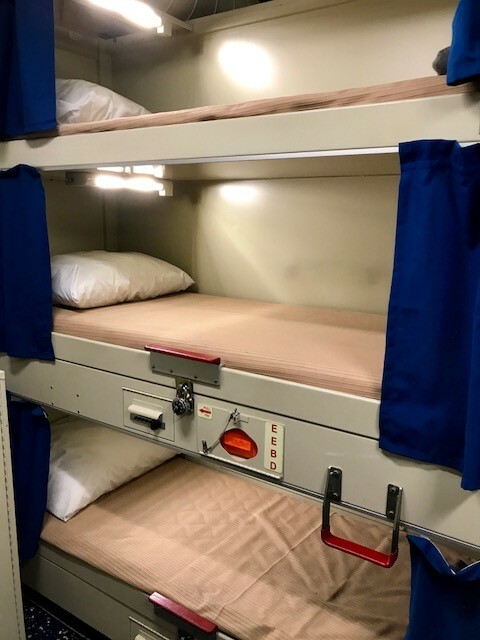 The smaller manning footprint allows for more living space for each sailor, and significant quality-of-life upgrades. 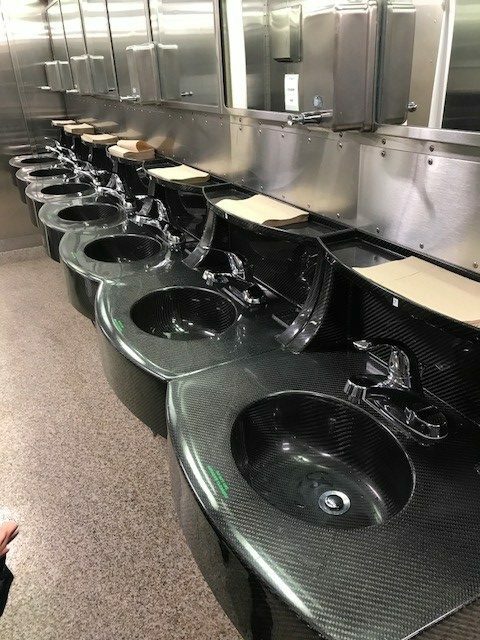 Berthing spaces, where sailors sleep, are larger and have bathrooms inside them so that sailors don’t have to dress and exit their spaces to use the bathroom. Lounges that were once inside the berthing spaces are now outside to reduce noise so sailors can sleep easier. Each bunk has its own USB port too. 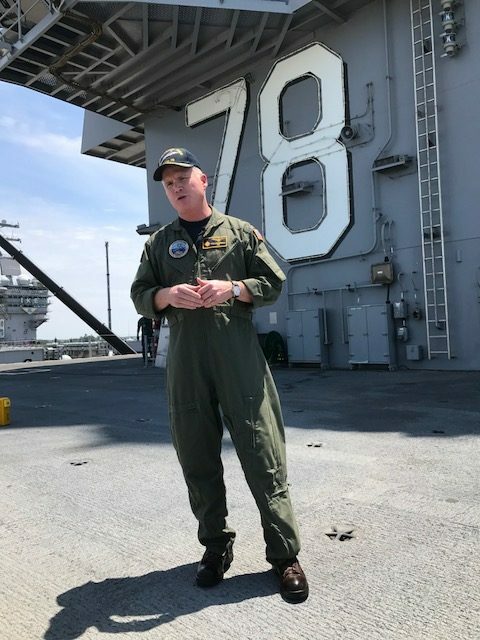 “Especially when you start looking forward to deployments, it can get very stressful onboard quickly,” he said. 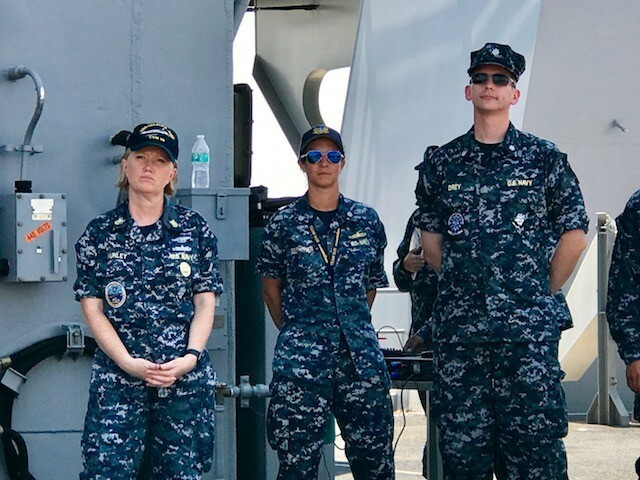 Sailors aboard the Ford attested to an immense feeling of pride for serving on what’s considered the Navy’s first model of its future aircraft carriers.